Conquer your most demanding work days with Cushman® Hauler 4x4 vehicles. 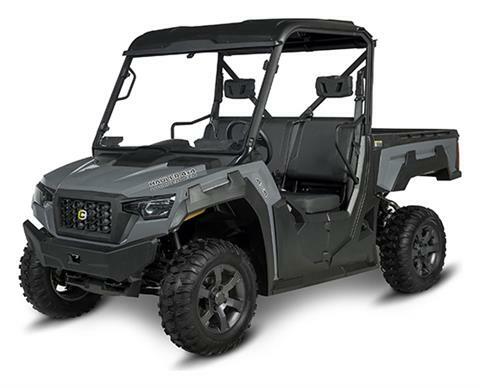 Bring more power and durability to your job site with the new Cushman® Hauler® 4x4 series of vehicles. Available in a quiet 50-hp gas or robust 25-hp diesel engine with a 1500-lb load capacity, these vehicles will tackle your most strenuous tasks without breaking a sweat. ALL TERRAIN TIRES: Easily navigate all kinds of terrain. MULTI-FUNCTION DISPLAY: Displays your vehicle’s status and diagnostics. GLOVE BOX: Added storage for work tools and PPE. UNDER SEAT STORAGE: For transporting additional tools or materials. HEADLIGHTS: Standard headlights with hi/lo beam functionality. 4-WHEEL INDEPENDENT SUSPENSION: Greater control for a smoother ride.